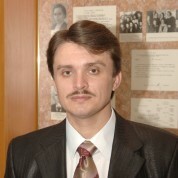 Alexander has been a high school mathematics teacher in the Russian Belgorod Region for over 20 years. His students take top places in the regional mathematical Olympiads every year and secure solid places in the national Olympiads. More than 50% of its graduates are stepping into the universities, where math is the main subject of study, and his pass rates are 100%. Focusing on creativity as well as the use of technology and group work within mathematical learning, he has presented research work in this area to the New Education platform of the Uspensky Centre for Applied Research. His methods have been published in the professional community and have been widely disseminated online, including on the website of the location Education Department. Alexander has contributed to the development of new teaching materials for an educational publishing house and has also created course materials on the history of mathematics. He has won numerous awards for his work, including receiving the title ‘Honoured Worker of General Education of the Russian Federation’ in 2011. For his work, Alexander has received numerous awards, including the title of “Honorary worker of education of the Russian Federation” in 2011 and recognised as the winner of the International Prize Nicholas Roerich in the “Education and Enlightenment” in 2009. Join the #TeachersMatter movement by sharing Alexander Chupahin’s update.